Taxonomy Filter for Calendarize it! | Calendarize It! 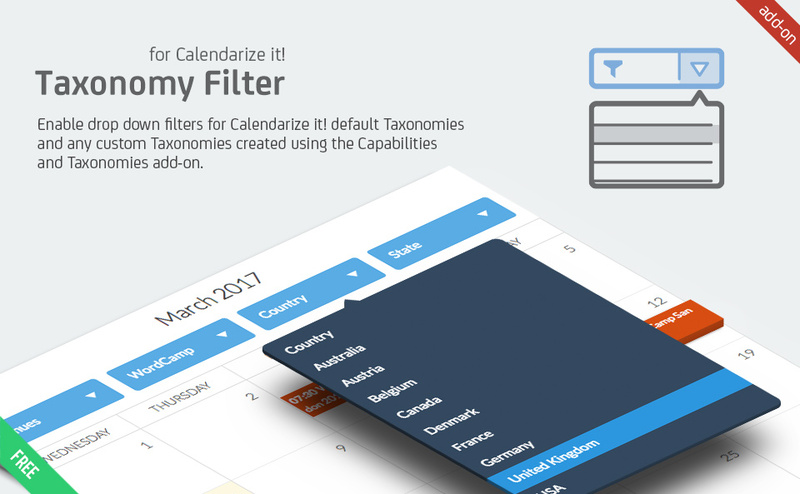 Taxonomy Filter for Calendarize it! is an add-on, which allows you to enable drop down filters for default or custom Taxonomies quickly. By default Calendarize it! has three built-in Taxonomies (filters), which are “Calendar,” “Organizers” and “Venues.” You can quickly add drop-down filters for these by adding the following attributes to your Calendarize it! shortcode. You can add these to the left side or the right side above the calendar by using the “header left” or “header right” argument. In this site, we have created the Custom Taxonomies “State” and “Country”, which we have inserted in the shortcode used below. You can add the attribute tax_filter_multiple. By default, the value is “1”. If set to “0” in Taxonomy drop down filters, only one value can be selected, not multiple. By default Calendarize it! shows nested child terms under their respective parent term. If you want to only show the parent term you can add the attribute btn_tax_parent_only. Add the slug of the taxonomy (example btn_tax_parent_only=”calendar”) of which you want to only show the parent terms. You can add multiple separated by a comma. If you are using the default shortcode the settings from the Options > Calendarize Shortcode tab will be used. You have the option to enable only showing parent terms. Please notice that this is a global setting and apply to all taxonomies. Only when using the shortcode can you specify the specific taxonomies. If you have the Event Color by Taxonomy add-on you can add color coding to the drop-down filters are shown above, and you can create this overview showing the different colors used. Currently, you can use the following arguments. New Feature: Added support for Custom Taxonomies not added by Calendarize it!